The TCEQ has given official notice of a Public Meeting on the Zumwalt permit application for a rock crusher (quarry). The meeting will be held on Tuesday, February 9, 2010 at 7:00 pm at the Lakehills Civic Center. This is an informational meeting to answer questions and discuss the application. You are encouraged to call the TCEQ office of Public Assistance (800) 687-4040 to ask about the meeting agenda and the permitting process. 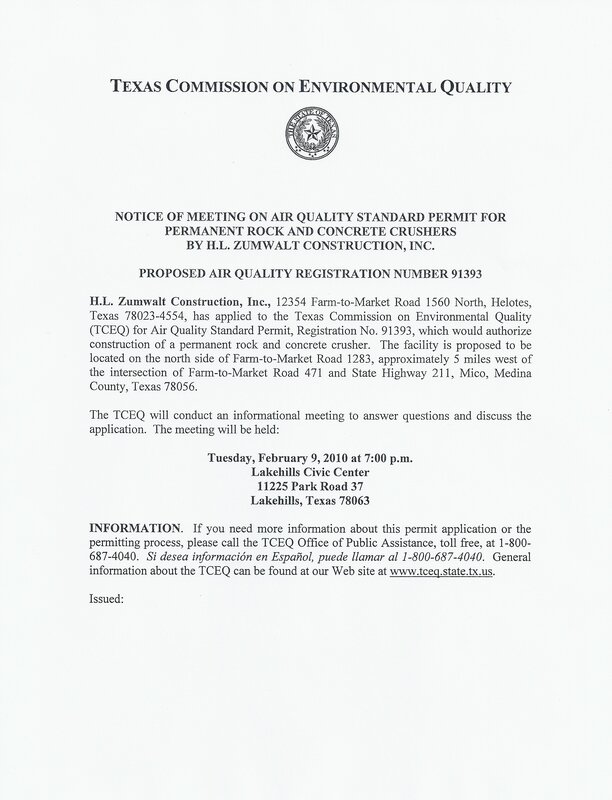 Please plan to attend the meeting on Feb 9 and share your questions, concerns and objections to this application with the TCEQ and our elected representatives. There is a very interesting article on TCEQ in the Editorial section of the Sunday SA Express-News.